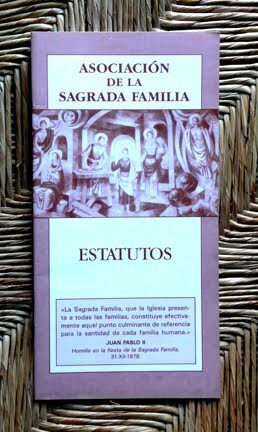 As witnesses and apostles of the mystery of Nazareth, while we carry out our apostolic mission, we do not forget that “among the many paths of human existence, the family is the first and the most important” (Letter to Families 1,1). The goal of our mission of “making a Nazareth in each home” is for us a challenge that we assume and carry out, mainly through the consecration of families to the Holy Family and by helping them live the values of Nazareth, among which we emphasize respect, welcoming, dialogue and interpersonal relationships, forgiveness, acceptance of God’s plans, the life of faith, among other elements of the Gospel of Nazareth. However, the announcement of the truth of the family cannot be separated from the announcement of the truth of matrimony, which is its origin and source. Matrimony and family are different realities, but closely related, and if separated, both will vanish. In recent years the conviction has grown that matrimony is the foundation of the family and that the spirituality of the family comes from the spirituality of the spouses. We are the primary ones who must “promote with great care the honor, imitation and cult of the Holy Family” (Constitutions 2), first and foremost through our religious consecration and the testimony of our personal and community life. We find collaborators among priests, religious men and women, laity and families, who share in the same common task, according to their own condition in the Church. In a very special way, families identified with the Nazarean-family spirit, make of it an essential part of their lives and are a living testimony and effective source to promote the imitation, devotion and values of the Holy Family in the bosom of the family group. Families will address this task of evangelization, first of all, towards themselves, for the spouses and parents are the priests of the home, and, inasmuch as they can, as a demand of their sacramental state, will extend it towards other families, promoting the good news of Nazareth through their testimony and pastoral activities in those places where they live (other relatives, parish, job, neighbors, friends...), or working together with the Sons of the Holy Family. The testimony of life of religious and families shows the complementarity of our calls in the one and primordial human call to love, whose image and full realization is the Holy Family, to whom we go to live, in a personal way and as a community, our self-giving attitude towards God and our brothers and sisters. Prompted by a special pontifical decree, we are called to promote the Holy Family Association, founded by Pope Leo XIII in 1892, and renewed and updated by John Paul II in 1987. Its nature and purpose match our call and mission. - As disciples of Nazareth, they welcome the Holy Family into their own home as an inspiration for their life. - As witnesses of Nazareth, they live in their marriage and family the Christian values of the Holy Family. - As apostles of the Holy Family, they proclaim in word and deed the fruit of these values to other families. In addition, members of the Holy Family Association, willing to live with more commitment their Christian life according to the Spirit of the Holy Family, can find inspiration, orientation and guidance in our Institute, joining us in a special bond and being part of it. To promote the honor, imitation of and devotion to the Holy Family, besides the Holy Family Association, we also use other means, such as the Monthly Home Visit of the Holy Family, International Congresses on the Holy Family, the Nazarenum Center, The Holy Family Magazine, the celebrations of our congregational liturgical calendar, etc. In order to be more effective in our ecclesial mission, we count on the presence and participation of the laity who share in our spirituality and mission. They are part of our Pastoral Councils, locally and in the Delegation. Meetings are held with religious and laity to exchange ideas and initiatives and to unify criteria. Each Delegation will schedule these meetings frequently. The spiritual legacy of the Institute—the example of life and holiness of Saint Joseph Manyanet, the testimony of our brothers who have gone before us, the traditions of the Institute and the contribution of the laity who have participated in our call and mission—have led to the formation of some specific expressions of the Gospel of Nazareth, which identify our works. encouraging and fostering work and co-responsibility. 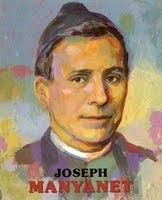 Confronting the great challenges of our time, we take very seriously the Lord’s command: “Go and make disciples of all nations.” The Church calls us to proclaim the good news from the Nazarean identity we received from Saint Joseph Manyanet, defined in the Constitutions and carried out through the tradition of the Institute. a. Our communion in an austere and humble life, imitating the Holy Family of Nazareth. b. Our communion in prayer, visiting every day the house of prayer of the Holy Family of Nazareth. c. Our communion in action, announcing the values of the Gospel of Nazareth through our ministry to families, which finds its inspiration in the Holy Family of Nazareth. The Lord Jesus, from the boat of Peter, continues inviting us to “put out into deep water.” Peter and the apostles trusted in Jesus’ word and cast their nets. We, faithful to the Holy Spirit, are called to do the same.